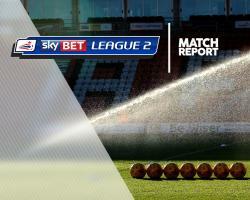 Carlisle staged a dramatic second-half fightback to seal a Sky Bet League Two play-off place after a 3-2 win at Exeter. Danny Grainger cancelled out Reuben Reid's ninth-minute opener for City before Jordan Moore-Taylor headed the Grecians in front at the break. But Grainger converted his second penalty of the match to haul Carlisle level after 72 minutes and Jamie Proctor sent 735 travelling supporters into raptures with the winning header three minutes later. The thrilling comeback means Carlisle will face Exeter again in the semi-finals of the play-offs. Having already clinched a play-off place, Exeter took the lead when David Wheeler headed the ball into the path of Reid, who smashed the ball past Mark Gillespie. But Carlisle were gifted a route back into the match after Ethan Ampadu handled in the box. Grainger made no mistake from the spot, ramming the ball into the roof of the net. The hosts regained the lead when Wheeler headed on Ryan Harley's corner and Moore-Taylor crashed home a diving header. Carlisle launched a second-half blitz and were awarded a penalty after Pierce Sweeney was adjudged to have tripped Proctor. Grainger sent Christy Pym the wrong way from the spot and the visitors sensed blood. And when Tom Miller's long throw was hurled into the Exeter box, there was Proctor to head home from close range.